Back in 2012, our family went on a cruise aboard Holland American's Oosterdam sailing from Seattle to Alaska. It was our second time doing that itinerary and according to Viv, "2 times too many!". Yah, she is more of the active traveler and seeing trees, ice and wildlife is akin to looking out our backyard in Winter. Despite her poor attitude towards the trip, we still had a good time and ended up meeting 2 new friends from Seattle, Scout and Lola (not their real names... LOL). We killed it onboard slaughtering the competition in every trivia session. Ah yes, Viv was having a jolly ol' time... So almost every visit to Seattle, we meet up with them. 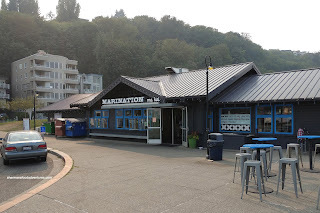 This time around, it was at their suggestion - Marination Ma Kai in West Seattle. 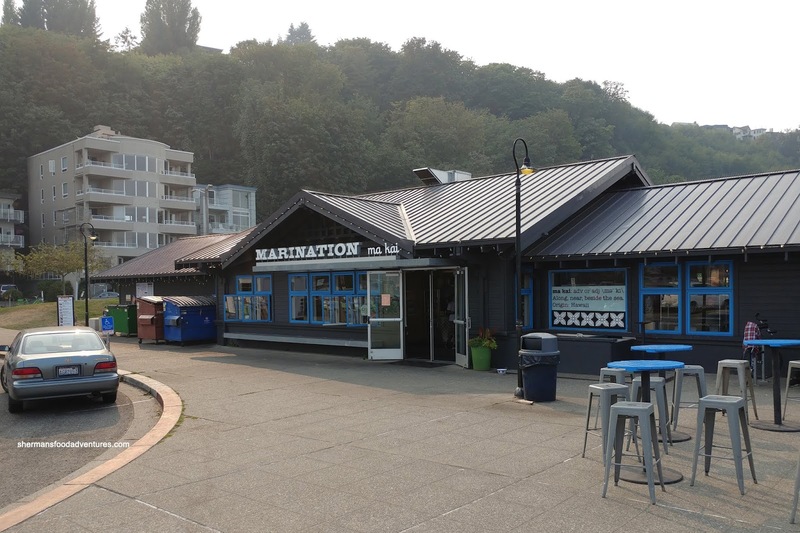 Other than the spectacular view and outdoor dining space, Marination also boasts an array of Hawaiian eats. Before we got to that, we ended up with something more typical of spot right near the water - Fish n' Chips with miso tartar sauce. 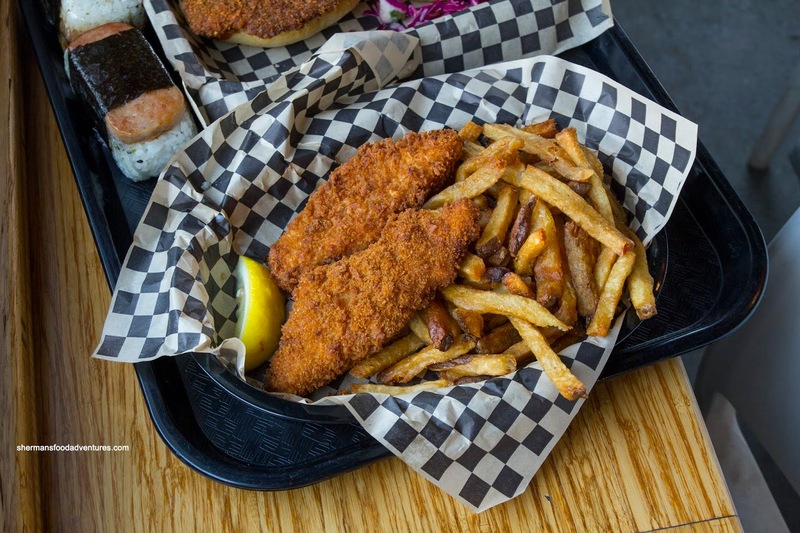 Panko-crusted, the fresh fish was flaky and moist. Although the coating appeared to be thick, it was actually light and crunchy. On the side, the house cut fries were on point being crispy with plenty of tender potato goodness inside. Impressively gigantic, the Pork Katsu Sandwich sported slaw, red onion, mayo and house-made tonkatsu sauce on a ciabatta bun. Crunchy and meaty, the pork cutlet was thick and tender. 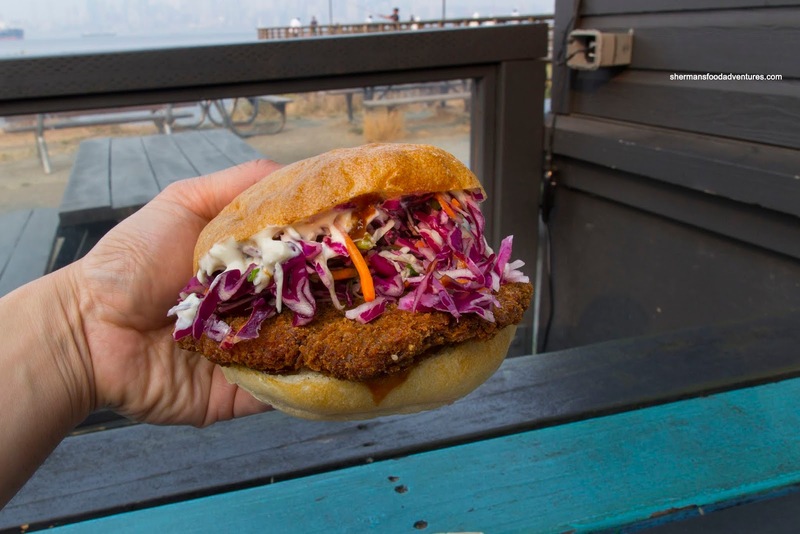 The mix of tangy slaw, creamy mayo and sweet tonkatsu sauce provided layers of flavour. The robust bun kept everything together. Of course we had to get the Spam Musubi because if we didn't the kids would have a hairy cow. Not that they wouldn't eat a hairy cow that is... So for good measure, we also got the Portuguese Sausage Musubi as well. 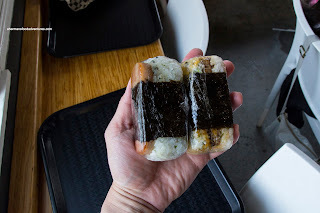 I personally enjoyed the regular Spam Musubi since it was familiar and the texture was complimentary to the chewy sushi rice. Not that the sausage wasn't good, it was meaty and nicely spiced, but the robust nature of the meat made the musubi heavier than usual. 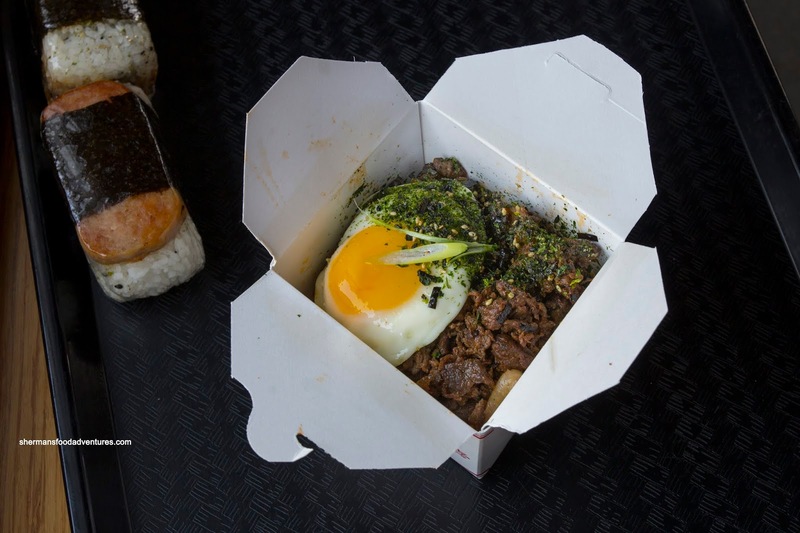 Underneath the good amount of kalbi beef and sunny side egg was Kimchi Fried Rice. This was further finished off with green onion and furikake. Adding the meat component on top of the rice made this a hearty dish where the chewy and well-seasoned rice was spicy and tangy. Trying to cover most of the menu, we also got both the Kalua Pork and Spam Sliders complimented by slaw and nunya sauce (mayo, gochujang, garlic and green onion) served on a soft Hawaiian-style roll. Once again, my preference was with the spam as it was one solid piece of meat that was familiar with its buttery soft texture. The saltiness really helped balance the slaw. Again, it wasn't as if the kalua didn't taste good. In fact, the tender pork was really yummy and it ate like a pulled pork sandwich, just without BBQ sauce. Lola also got the sliders, but added a Kalbi Beef Taco on the side as well. 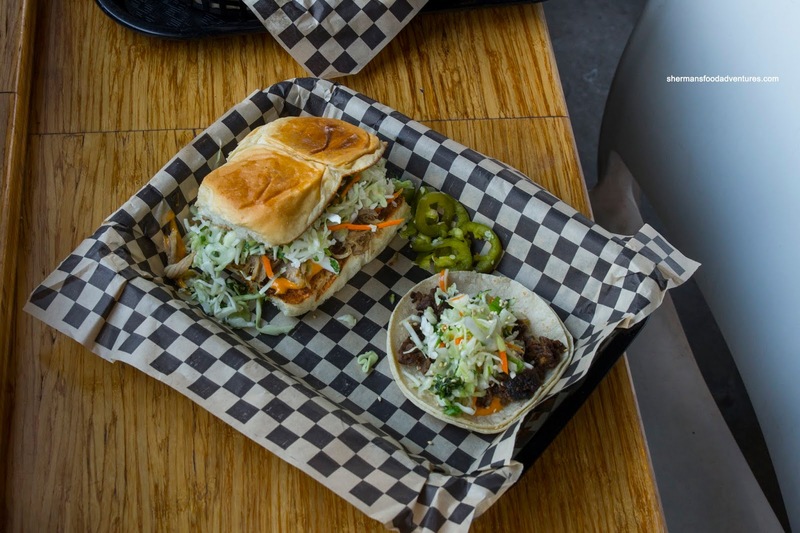 It was served on a corn tortilla and topped with slaw, pickled jalapenos, sesame seeds and nunya sauce. 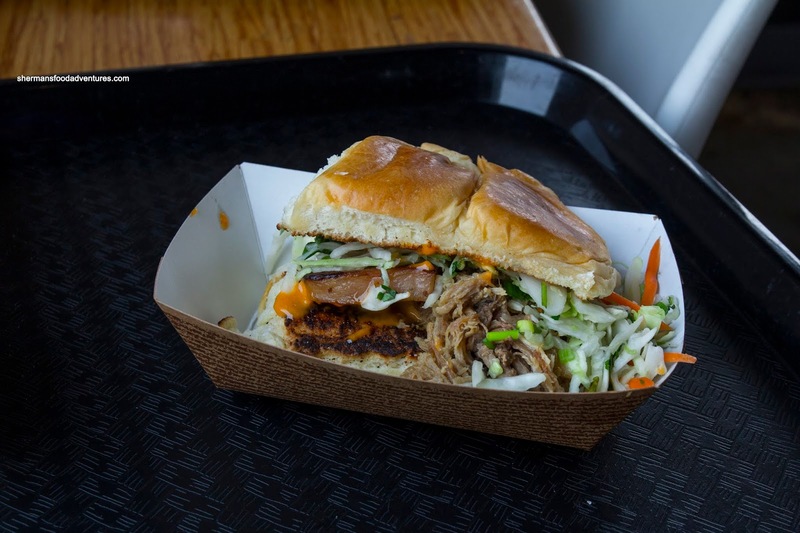 It sported the same well-seasoned beef from the rice we had as well as the same slaw and sauce from the sliders. Tasty little bite. 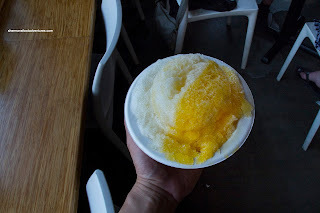 We ended things off with Hawaiian Shaved Ice in a mix of Mango and Lychee. This was not as sweet as it appeared, but flavourful enough that we could discern what it was. Nice and refreshing and while it ain't as fluffy as Korean bingsoo, it was good in its own right. Reminded us of grabbing shaved ice in Lahaina. That would probably be the best description of the place. A taste of Hawaii right by the water that emulates the island experience. With reasonable prices and a killer view, there is not much to dislike about the place.